Home / Fanboy Fail Fridays! • FANBOY FAIL! • Fanboying! • Hall Of Shame • Stars of the 1980's and 1990's / Fanboy Fail Fridays! Trying To Meet Fargo Star Steve Buscemi! Getting Dissed But Being Blessed With Sigourney Weaver! Fanboy Silver Lining! Fanboy Fail Fridays! Trying To Meet Fargo Star Steve Buscemi! Getting Dissed But Being Blessed With Sigourney Weaver! Fanboy Silver Lining! I honestly thought I would be typing up my Fanboy Fail With Molly Ringwald this friday, but instead I’m going to have to go back to last year. See, I thought it was going to be a fun easy night… Instead… Well.. Fanboy Fail! Tonight was also the night of the Abduction movie premiere. 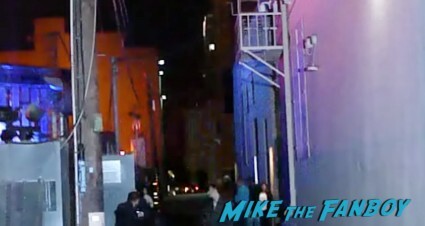 Yep, the shirtless werewolf was right across Hollywood blvd. Now, normally I would be there, not for Taylor Lautner but for Sigourney Weaver! I have a Dave mini poster for her to finish. But I also have a Fargo mini poster for Steve Buscemi to finish so… What to do? I chose Steve Buscemi… Now, seeing Steve in person he didn’t seem like the most jovial guy in the world, I mean he’s known for his cranktankerous personas, but with only about 15 of us I figured… Eh… Why not! When Steve arrived he waved and even though he looked cranky, he waved so that’s generally a decent sign. Now, Tara… Who just recently sent in her photo fail with Bradley Cooper decided to go to the Abduction premiere and was nice enough to take my Dave mini poster for me. that was so cool of her, and I’m really thankful she took the time to do that. I really thought that Steve Buscemi would come over and sign, I really did. In fact, I sort of took it for granted, I was like “yeah, he’ll do it.” Uh huh…. As a post script, a few people ran up to Steve later on in the same night. Apparently, he went to the premiere! And he dissed them basically two on one! 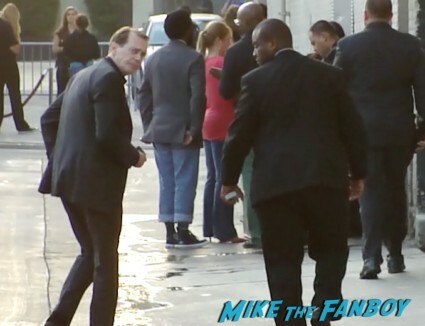 Doh… I guess my fanboy instincts are wrong when it comes to Steve Buscemi. Who knew! One day, just like with Molly Ringwald my Fargo poster will get done. Until then… I have my Dave poster to enjoy! 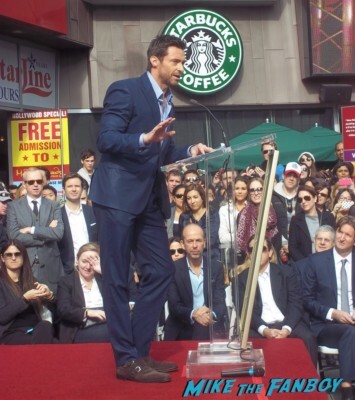 Hugh Jackman’s Walk Of Fame Star Ceremony In Hollywood! With Anne Hathaway! Amanda Seyfried! Autographs! Photos! And More! Fanboy Fail Fridays! Having Academy Award Winner Cate Blanchett Hide Under Car Seat To Avoid Looking At Fans! So Dramatic! Stan Lee’s Los Angeles Comic Con! Meeting Aliens Star Jenette Goldstein! The Sci-Fi Museum! Hot Topic! Convention Floor! And More! Pretty In Pinky! Emmy Awards 2012 Special! With Christina Hendricks! January Jones! Zooey Deschanel! 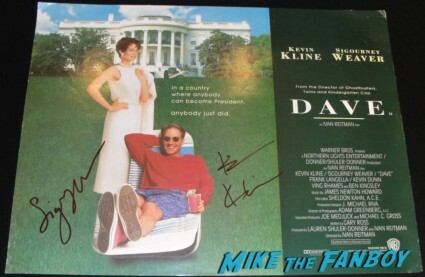 Kevin Costner! Michael C. Hall! And More! Buscemi to “finish” your Fargo poster? So you do have Francis McDormand and her husband ( one of Cohen Brothers ) on the poster? I thought both didn’t sign autographs anymore. At least Tara had you covered with Sigourney. Got Francis! and William H. Macy. With Steve I’m calling it done! The main cast! All is good. Just wondering if you got Francis before she stopped signing. This is a cast piece that is worth having! When did you get Francis may I ask? Yeah, this was a while back. She still does it, it’s just very rare and few and far between! Just as an FYI, Francis was extremely kind to her fans when she was on Broadway last year. She signed hundreds of pictures through the mail. I got her. I never “trust” stuff signed in the mail. Unless you witness it in person you can never be 100% sure. “Extremely kind”? Doesn’t sound like Francis’s m.o. To be honest, that never being 100% does not really hold up in reality. Every autograph I have got ttm, I am 100% sure it’s real (excluding pre printed autographs obviously). Now, I do put time into looking up who sends fakes, so that obviously help. The great advantage of ttm is that, when they choose to sign, you almost always get a full/neat autograph. Huh? How can you say that James? If you don’t “witness” that person signing in front of your eyes how can you say it’s real with certainty? When I get someones autogaph in person I know it’s real because I was there. I’d like to believe that getting graphs through the mail is real all the time but there’s always a doubt. Also getting a full and neat signature is rare these days with the crowds. Usually now it’s a scribble or initials at best. However both these points have exceptions.